Yashinsky sows stories along the wayside as he explains how and why listeners are hooked, reveals the secrets of story hosts, and describes the extraordinary characters who have sparked the contemporary international revival of this most universal and durable of the arts. Yashinsky himself is one of those extraordinary characters. He gives us much to laugh at, provoke thought, wonder about, and remember and pass on. If the word awesome had not been rendered meaningless by trendiness, it would be the adjective for this book. As it is, spell-binding will do. It seemed impossible to me to write a good book about storytelling but you’ve more than succeeded … [A] rich, deep book about family, community, heritage and stories. [The] writing is clear, bright and alive. It’s wonderful. Cultural history, instruction, memoir and personal stories collide when this Canadian storyteller reflects on how storytelling grounds us in a digital sound-byte society. He explores how stories enable us to find our identity, celebrate our families, shape our lives and create communities. The art of storytelling is viewed through his decidedly philosophical, humorous, inspiring, and instructive lenses. Central to the book is his belief that the stories we give away are the only ones we keep. Suddenly They Heard Footsteps is part autobiography, part collection of Yashinsky’s own original tales and retellings, and part inspirational sermon sure to motivate anyone whose keen edge of belief in the importance of storytelling has been worn down by demands for curriculum relevance or competition with clowns. Yashinsky truly loves and understands the old tales, although he often resets a tale into modern times. The poor peasants’ cottage becomes a shack so far from town that their b&wTV only receives one channel, the greedy king becomes a corporate land developer, and the devil sells computers which can remember everything for you. His “traditional patterns that I’ve rewoven with new yarn” spin out at a rich and leisurely pace, filled with adroitly described places and oddball characters. He invites us to retell these tales in our own words. An extensive annotated bibliography ensures that we’ll have no excuses for doing our own research, and his example is the best inspiration. Perhaps even more important, however, are the early chapters in which he describes his own journey into storytelling, his hard knocks and triumphs, and his continually growing conviction that we must keep oral storytelling alive. If you need a refreshing reminder, I highly recommend this book to rekindle your own fires. Suddenly They Heard Footsteps is at once a polemic for storytelling and a personal memoir, a handbook for prospective storytellers and an anthology of tales from which the reader may borrow. 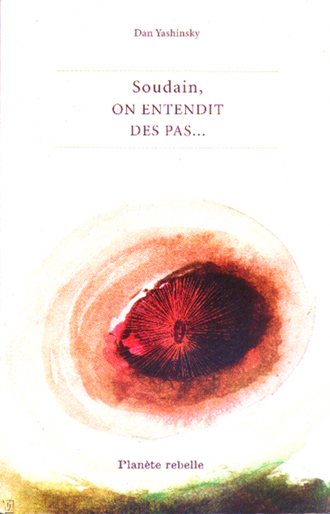 It is a passionate work of deeply held belief … . Readers will come away from Suddenly They Heard Footsteps with all the basic tools and the inspiration they need to try storytelling for themselves. A melange of memoir, social history and how-to guide, Yashinsky’s love of the spoken word imbues the whole package with warm authority. In celebrating the storyteller’s art, Yashinsky has tapped into a motherlode of universal need, the thirst for a story that shows us what it is to be human. 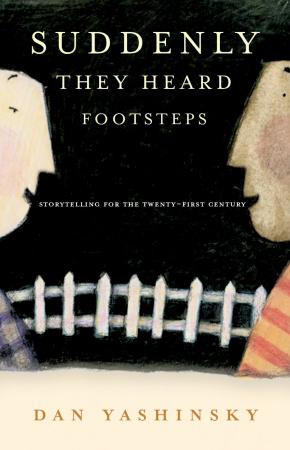 I’ve been reading storyteller Dan Yashinsky’s Suddenly They Heard Footsteps, an account of how he became a storyteller, what he learned from each of his mentors, the role of storytelling in family life, and how he adapts traditional stories to contemporary circumstances. He ends with a gathering of stories he likes to tell. It’s wonderful to be in the company of someone who is passionate about his craft, plus I happened to have it with me when attending my father’s bedside in the wake of a sudden and serious surgery. Because Dad didn’t have much energy for conversation, I spent time reading aloud to him from Dan’s book, a touching demonstration of how books sometimes let you broach the deep subjects slant.